Blood diamonds are diamonds that are illegally mined and traded by outlaw or rebel groups. They are usually traded in areas destructed by wars to fund the military against legitimate governments. 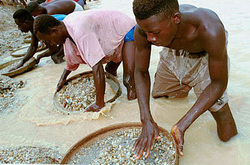 Blood diamonds (also known as conflict diamonds) are closely associated with violence in the African countries of Sierra Leone, Angola, Liberia, and the DRC. Test your knowledge on blood diamonds before and after learning about it! 1. What are blood diamonds usually traded for? 2. What is the process that makes sure diamonds come from a non-conflict source? 3. How does Charles Taylor relate to blood diamonds? 4. What was UNITA and what did it do? 5. Which of the following groups do NOT mine for blood diamonds?